Cuckhamsley Barrow or Scutchamer Knob is said to be the resting place of one of the two Cwichelms of the Royal House of Wessex named in the Anglo-Saxon Chronicle. One, an otherwise unknown prince, died in 593, the other, son of King Cynegils & Sub-King of Upper Wessex, died in 636. Hence the mound’s name, Cwichelm’s Low, first recorded in 990. Alternatively Cwichelm’s men, who were killed in some great battle, lie here. However excavation has shown the mound to be non-sepulchral. The 13th century St. Albans Chronicle states that it was here that King Edwin of Northumbria killed Cwichelm of Wessex, not in 636 but ten years earlier. Cwichelm had sent his henchman to assassinate Edwin, but when the attempt was bungled, the Northumbrian King swooped down on Wessex and either slew all whom he discovered to have plotted his death or forced them to surrender. But was Cwichelm among them? The Anglo-Saxon Chronicle says not. He fought against the Mercians in 628 and died the year he was baptised by St. Birinus at Dorchester (Oxon), eight years later. On the other hand Cuckhamsley may have been the site of the signing of a charter whereby Cwichelm received 3,000 hides of land by Aescendun from the King of Wessex. This charter is certainly known from 648 when King Cenwahl affirmed the grant to Cwichelm’s son, Cuthred. Hendred may come from the Saxon Henn-Rid meaning “Wild Bird Stream”. However, there are also two likely Celtic derivations: either from Hen-Rhydd meaning “Old Ford”, or Hendref meaning “Winter Cow-Shed”. The manor, Hendred House (or Arches), is a lovely old medieval H-shaped building with a 15th century hall (recently re-opened to the rafters) and a small chapel dedicated to St. Amand. This chapel is said to be one of only three built before the reformation which has never been used for protestant worship. The reason for it’s dedication is unclear but is probably connected with the family of the same name who were Lords of nearby East Ilsley. After falling into decay after the reformation, the chapel was restored (1687) during the reign of the catholic King James II. Then the protestant army of William III passed by during the Glorious Revolution of 1688 and totally ransacked the little building. Fortunately it was restored soon after. Today, among its many treasures are a medieval stained glass window depicting the last Abbot of Reading and the stone coffin-lid of a Prior of Poughley (Chaddleworth). The house’s present owners, the Eystons, are direct descendants of the original Arches family after whom the manor is named. They have always remained catholics and are relatives of Sir Thomas More (and still have his drinking cup). Another fine timber-framed manor house, still with its original gatehouse, is King’s Manor, given to the Carthusian Sheen Priory by Henry V. The Carthusians are the funny ones who live in separate cells and don’t see, let alone talk to each other. These monks built the 15th century Chapel of Jesus of Bethlehem and accompanying priest-house that stands on the village green. It is locally known as Champ’s Chapel after the family who had a wash and bake-house there in the 18th century. It is now a village museum. The King’s Manor passed into Royal hands at the Dissolution of the Monasteries, hence its name. Abbey Manor, on the other hand, belonged to Reading Abbey. 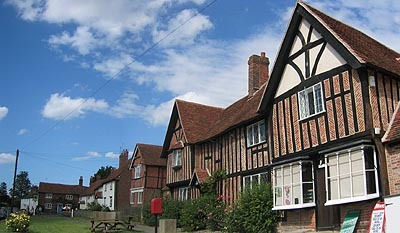 There are many interesting old timber-framed and thatched buildings in the village. The local shop is particularly spectacular. The Eystons built a catholic church in 1865, but the parish church is fourteenth century. The latter has a faceless clock and a crusader lectern featuring a foot stepping on three crocodiles! Back in the 40s, the ghosts of Roundhead soldiers without feet were seen in a cottage in the village. It is believed that some of the parliamentarians slept here after one of the Battles of Newbury. In later centuries the floor had been raised, hence the lack of feet. © Nash Ford Publishing 2001. All Rights Reserved. This location is now administered by Oxfordshire County Council.